Microsoft Teams – the Redmond giant’s workplace productivity and collaboration service – is celebrating its two-year anniversary. To commemorate the occasion, the company has announced a host of new features for the service. The company has announced eight new features, three of which are will become available now, and five will be released at a later date. Microsoft also revealed a few statistics about Teams, including how over 500,000 organisations use the service today, with 91 out of the Fortune 100. It added that Teams is used in 44 languages across 181 markets. Alongside, the company announced that Teams will soon be available in eight new Indian languages – Bengali, Gujarati, Hindi, Kannada, Malayalam, Marathi, Tamil, and Telugu – apart from Filipino. 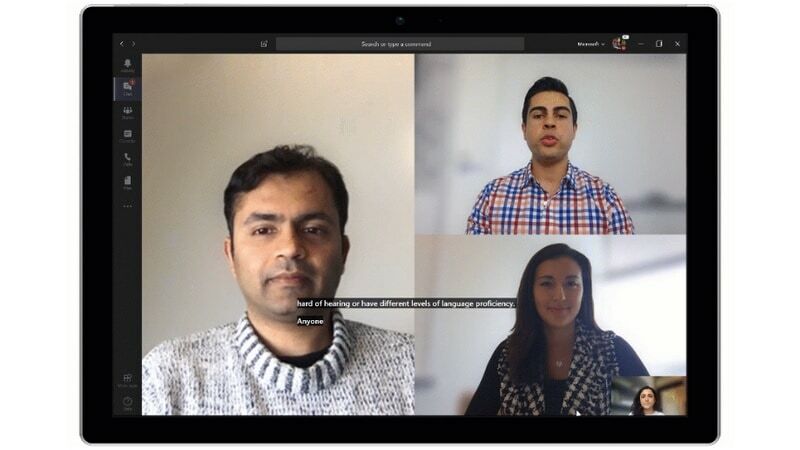 The key new functionalities coming to Microsoft Teams are customisable backgrounds during a video chat, content cameras and Intelligent Capture processing, Whiteboard support in Teams meetings, live captions and video call subtitles, live events, secure private channels, information barriers, and Data Loss Prevention (DLP) in chats as well as conversations. The ability to choose a custom background of one’s liking during video cats is a cool new feature that will allow users to apply a more suitable background during a video call. This feature lets users choose any image as their video call background and is set to arrive later this year. Another productive feature is a new addition to Microsoft Teams Rooms. Supporting an additional USB camera to capture content such as stuff written on a whiteboard, Microsoft Teams Rooms can now use Microsoft’s Intelligent Capture processing to enhance the text and images on the whiteboard, as well as focus and resize them accordingly. This will make it more convenient for remote participants in the meeting to have a better look at the content. For example, the person standing in front of a whiteboard will appear as a translucent shadow so that content covered by his/her body on the whiteboard can be clearly seen. This remarkable feature will arrive later this year. The Satya Nadella-led company will also bring support for Microsoft Whiteboard in Team meetings, allowing all participants to collaborate more effectively by sharing ideas on a single digital canvas. Participants will even be able to push content from a physical whiteboard to the shared Microsoft Whiteboard with ease. This feature is currently in public preview. Another helpful feature is support for live captions and subtitles for Teams meetings, allowing the speaker to convey their message more effectively to participants with hearing difficulties or language proficiency barriers. The live captioning feature will soon arrive for the English language as a preview for Microsoft Teams users. Moreover, Microsoft’s collaboration service has received support for creating live events and it is now available to all users, allowing up to 10,000 participants to tune in to an event. These live events can be used by Teams, Stream, or Yammer users. On the front of security, Microsoft Teams will get support for secure private channels later this year, allowing admins to more efficiently control who can access conversations and information in a particular channel. A similar feature set to arrive soon is the ability to establish information barriers that will let users control which members can communicate with each other and collaborate on a project. Another privacy-centric feature, which is now widely available to all Office 365 and Microsoft 365 subscribers with Office 365 Advanced Compliance, is the ability to set Data Loss Prevention (DLP) policies. DLP policies for chats and conversations will allow admins to specify and detect sensitive information in conversations, and also protect certain information from getting leaked by protecting it with conversation channel barriers.